Philadelphia's St. George's, America's first Methodist church (and today the world's oldest Methodist church in continuous service), invited Allen to preach. Thus, in 1786, Allen returned to the city of his birth. In Philadelphia, Allen found a city where almost 70 percent of the blacks were free. He started preaching regularly at Sunday 5 A.M. services, though he found this an uncomfortable time to be at the pulpit. Allen would then preach three or four more sermons at different churches every Sunday. Allen's preaching was so successful that new members joined St. George's weekly, building particularly the black portion of the congregation. In Allen's own words, he appealed to his "African brethren, who had been a long forgotten people," few of whom attended public worship. White leaders at St. George's viewed the new influx of black parishioners warily. Black members of the congregation were forced to sit toward the back of the church during prayers and were sometimes made to stand. Recognizing that black congregants had special spiritual needs, and that the white congregants were growing uneasy with the burgeoning black population in the church, Allen approached the elder at St. George's and asked his permission in establishing a black church. The elder denied his request. In a year's time a new elder again denied Allen's request, and also rebuffed Allen stridently with what Allen called "very degrading and insulting language." To counteract the baleful influence of St. George's, Allen, along with Absalom Jones, came together to form the Free African Society (FAS) on April 12, 1787. The Society, though not religiously affiliated, proved much like a church in serving the black community. NAACP founder, W.E.B. DuBois, writing a century later, called the FAS, "the first wavering step of a people toward organized social life." Organized as an altruistic society for extending mutual aid to the widowed, sick, and jobless, it was funded by dues-paying members. The core of Allen's beliefs can be summarized with his trust that members by lifting themselves would lift all black people. The society also regulated marriages, taught thrift, censured drunkenness, condemned adultery, and attempted to improve morals. Back at St. George's, interracial tensions increased. Growing membership necessitated a church expansion. Black church members were the most generous contributors of time and money to help build a new gallery. What they did not know was that the expanded upper gallery was targeted exclusively for the growing black membership. 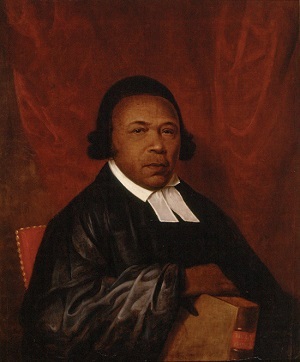 On a November Sunday in 1787, at the first Sabbath service after the church's renovations, a sexton ushered Allen, Absalom Jones, and prominent black church member William White to seats in the new gallery which was situated above the old part of the church. As the trio was a little late, they instead took seats near where they had formerly sat before the renovation. The service started and the congregation dropped to their knees in prayer. Allen looked up to find a church trustee trying to wrench Absalom Jones to his feet. It seemed that blacks were not to sit in the old gallery but to be relegated to the new gallery. An astonished Jones said to the trustee, "Wait until the prayer is over." The martinet replied, "No, you must get now, or I will call for aid and force you away." The devout Jones replied, "Wait until the prayer is over, and I will get up and trouble you no more." Then another trustee came and tried to pull William White from his knees. Allen recalled, "By this time the prayer was over, and we all went out of the church in a body, and they were no more plagued by us in the church."